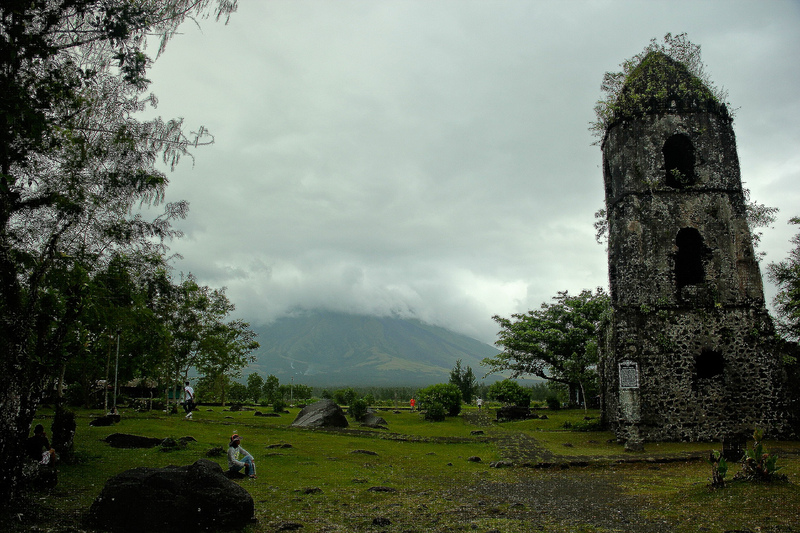 Going to Daraga, Albay to see the Cagsawa Ruins would take around 3 hours bus ride from Naga City, Camarines Sur via Legazpi bus route. The stop-over keeps the pace slow as passengers were to pick up in some of the towns while on its way to destination. 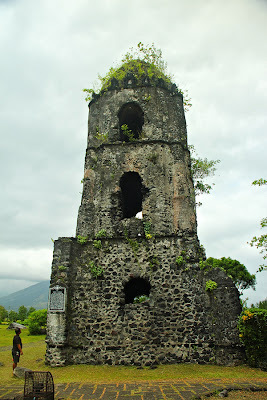 It was in 2002 the last time I visited Cagsawa Ruins with my family. Ten years later I decided to visit the place once more, in March 18, 2012. I left Pasacao as early as 830 a.m. You will see the grandeur of Mt. Mayon and the Cagsawa Church as the main spots of this tourist destination. The bridge to the ruins was under reconstruction as it is temporarily closed for vehicles. The clouds covered the cone of the Mayon Volcano which may be quite disappointing to some, especially to those photo enthusiasts. By 230pm I decided to leave the place and go back to Naga City. Daruanak Island is a popular tourist attraction among the Bicolanos. In my hometown, it serves as a landmark for the visitors to be able to find out they are already in Pasacao, Camarines Sur. In Day 2 (March 17), I spent my time in Daruanak since last time I visited the island was in the year 2000. I hired a motorboat made via the town of Balogo since this is the nearest place you can reach the island. It is actually a 15 minute boat ride from Balogo. The first thing that you will see when you get in the island is the abandoned small cottage which serves as a shelter when it is sunny or rainy. If you want to get there, there's a landing fee of 50 pesos for every boat. It's cheap! I also had an extraordinary experience of acquiring great energy in the mystical Daruanak island. If you are in Balogo beach, the cost to rent a boat is only 300 pesos. The bigger the size of the boat is the more expensive it can be. But if you happen to be in Camangui beach, renting a boat can cost you 350 pesos and you will be able to reach the island in 30 minutes. If you get to the other side of the island, you will see a stair going up to reach the peak of the island. As Daruanak Island serves as a tourist destination, it is good for skiing and snorkeling or sight-seeing. It is easy to get to the island and there's no way you will get lost as stated earlier, Daruanak serves as the landmark of Pasacao. If you are commuting, you have to go to LCC Mall as jeepney terminal is available in this place. You have to get the jeepney with the sign "Pasacao". The cost to go to Pasacao town is only 30 pesos. Going to Pasacao is 30-45 minute ride. There is also a van available in the terminal and will cost you 50 pesos. Ask the driver to drop you in Balogo crossing. 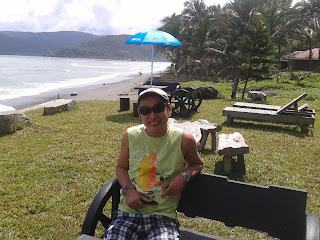 This is where you can see "padyak" going to Balogo Beach resort. 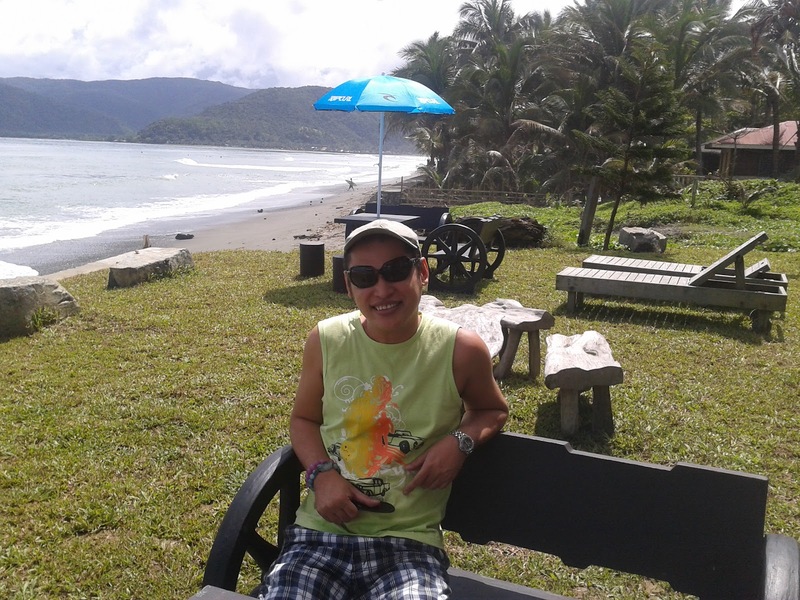 The padyak operator will bring you to the Beach and it will only take you 15 minutes to reach the resort. Before I left Cubao last Friday night for my travel series, the first thing that came to my mind was my itinerary once I get Pasacao, Camarines Sur. But plans going to Bicol were already made prior to my departure except that some of my trip had to be altered like my plan in going to Matnog, Sorsogon. In that way, it could have been my time to go to Biri, Northern Samar. The bus left at 8:30 p.m from Rustan's Cubao terminal. 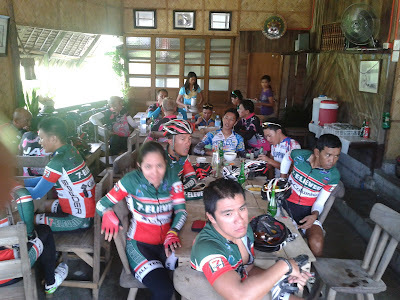 and we had a stop-over in Sariaya, Quezon where we had dinner. The bus arrived 7 a.m. in Naga City where I stayed and had a breakfast at McDonald's. Shortly I left the city and headed up to the terminal where the jeepneys are located bound to Pasacao. Upon my arrival in my hometown, I was received well by our tenants and prepared foods for our lunch. I went to the shore in the afternoon just to have a short walk and find out what it's like there two years since the last time I visited the beach. There were some additional good cottages installed in the beach. I sat in one of the cottages and took my laptop from my bag to check my email account and Facebook. This song means so much to me that I decided to record my own cover version. I couldn't help myself but to listen to this recording a lot of times. So I created my own video featuring my own photography that was taken in different places like Caliraya, Laguna, Batanes, New York, USA; Cozumel, Mexico; Louisiana, USA; Morong and Binangonan, Rizal; Marinduque Island; Pasacao, Camarines Sur and Baler, Aurora. I always find myself listening to this song and hearing this song makes my heart yearn for love unconditionally. Love transcends all; something to learn by giving rather than taking. Popularized by Hajji Alejandro, it was revived by Lani Misalucha. Today, I went out for a road trip made via motorbike vehicle we drove from Tanay, Rizal to Caliraya, Laguna. It took us about an hour and a half to reach our destination. 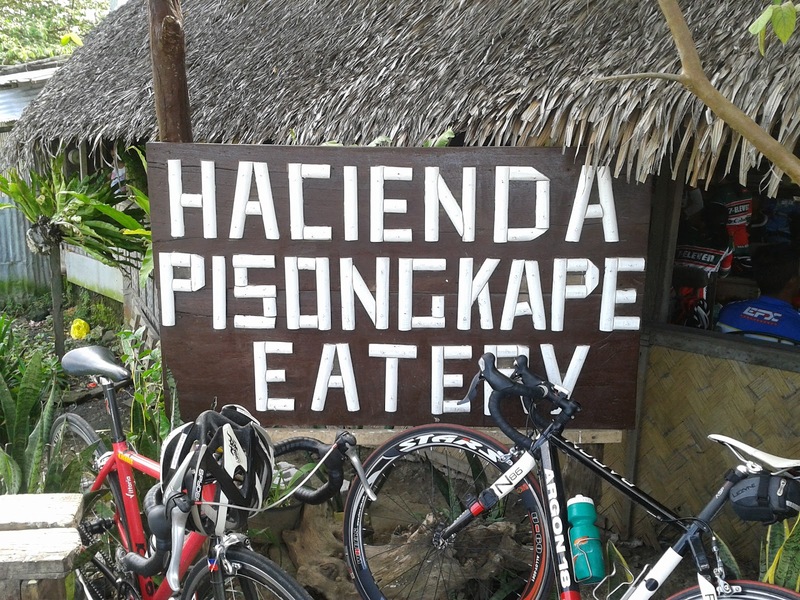 We had lunch in Pililia, Rizal first, at Hacienda Pisongkape Eatery where some of the bicycle enthusiasts had their stop-over too. And we had another stop-over at the overlooking place in Pililia. As an alternative path to Caliraya, it cuts a long drive if you are coming from Antipolo, Rizal. The trip went smooth though, except for some rain showers we had encountered while along our way to Caliraya. The Japanese Garden is one of the most sought attraction in Caliraya as it offers a cool breeze air and an overlooking terrain. So it was our time to go back to Tanay, and we dropped by to some of the popular destinations in Laguna. We visited Sierra Hills Exotik first, where some of the animals like anaconda, sawa, kalaw are popular attraction among the tourists. Then we proceeded to Paniquil River Eco-Park. I'm not setting the bar high to a person who wishes to go with me in my out of town trip but I have my own guidelines so that traveling will come easy, fun and enjoyable in both ends. My personal guideline is a set of norm that will avoid differences between myself and a person that I go with to spend some time in a preferred travel destination. As a backpacker, It is normal for me to go alone and I got used to it without any companions. I'm not really introvert, it's just that I can truly enjoy traveling with no bonds at all. I have lived with it to be a sole traveler here and abroad, learned so many things and lessons from being a jetsetter. But I don't limit myself to a single slot as 2 to 4 persons sounds good to me. I prefer to go with people who have the same interest as me - photography and nature tripping. In some cases, I could be picky at times as I have my own reasons why to avoid some dislikes that will most likely spoil the entire trip experience. As some may like to go somewhere else that they can think of and have a tendency to become indecisive, I find it quite uncomfortable and it may piss me off when lots of decisions and changes are made by the goers in some point in time. Should love photography - traveling goes along with some shots and without photography, your traveling experience will not be complete. You must bring your own camera, whether it's a digital camera, mobile phone or dslr, it doesn't really matter to me. Well I am not your personal photographer and one should not expect that I should take you some photos for your own personal gratification. I love photography, I love to take some shots of people, animals and natures as photography is part of me. Should love nature - One of the reasons why I love to travel because of my degree of interest in nature is extremely high. I love to commune with nature. I love to hear the roaring seas, chirping birds, feel the breeze of the air. A city life can be toxic and the nature heals the stresses incurred from the pollution, the pell-mell of the crowd along the streets and the accelerating cars, jeepneys and buses in the road. Should love to eat foods - I love to eat most of the time, especially the authentic foods that locals can offer as this reflects their culture according to the delicacies that a place can offer. And usually I don't go to the common food chains found also in Manila. Must not be a drama king and queen - I do dislike people who are "maarte" and "sosyal" and hearing them say "yuck" irritates my ear. If a person is into drama, he or she'd better go to the movie and go to best inns or hotels in town. I like to be with people who are flexible at any given situation and can adopt to certainties regardless of his or her social status. No Romeo and Juliet allowed - If you are traveling with me, you should detach your love affairs in the mean time. I prefer with people who are not into courtship or relationship status. Forget about these things as the situation would only exasperate me seeing them in PDA or public display of affection. I hate romantic gestures. Remember this is not your honeymoon and I'm not your chaperon to assist you with your needs. And I also dislike to see a person texting or calling one's boyfriend or girlfriend from time to time as if they seemed to have no companion at all. Should be time conscious - To take traveling experience more complete and enjoyable, one should be able to take into account of his/her time. It's not easy when you are ready to leave and your companions are still grooming and choosing their best suits. It's not worth waiting for as this would only consumes our time. Just go to the party and forget about your vacation. These are the guidelines that one may keep as norms to experience a high level of excitement in traveling to a certain destination and somehow without leaving your companion in unhappy state. In this way, we can be a better travel buddy. I feel the intensity of the heat all over my body with emerging rapid heartbeat, and this happens almost everyday. The sensation makes me feel so uncomfortable and it usually accelerates from my face and chest following to my arms and hands. It goes with the state of confusion and it felt like I was completely lost in space. As part of the awakening process, my higher sensitivity to energies had become more intense. I get some advises though, telling me to go with the flow and I remember when I was in Baler, Aurora recently, my friend who happened to be in the Middle East, after confessing to her that I am in the awakening stage the day she called me up, congratulated me for having experienced this process. She advised me to read the book "The Power of Now" since I can learn a lot of experience from the author of this book. As a sensitive person, Seems that I could perceive some senses, but not far too easy, especially when a person is resonating with me. It's just that I am more prone to receive thoughts and my sensitivity allows me to feel their energy and get to be aware of their wave length. It feels like I get the signal once a mutual energy manifests in convergence to my body. It's just so pretty weird though but I hope not to focus on this at this time. It's like that I was connected to some people that I don't even know what it is. Call it the "unknown" experience. I've been torn in two things since the awakening stages triggered to myself. The first one is the quest for some information about my experiences via online, and the second one is keeping that awakening process abreast, although I felt uncomfortable with it most of the time. One reason why I deactivated my Facebook account because I get drained and become sick lately. It never happened to me before in Facebook but it's just that I am becoming more sensitive as the awakening process is currently taking place in me. It's the thought being planted and read about once some people post something in the Facebook wall and if perceive, this have a detrimental effect in my body. It is similar to what happened to me in 2008 when I got sick and it took me a month to recuperate and recover from my illness. But I am not burning bridges not to return to Facebook again. I know it could be pretty hard without a Facebook especially when you are extremely hook to it. So at this time, I'd rather spend my time writing a blog about anything I can think of, including my experience in the spiritual awakening.